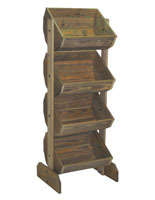 Spruce pine wood adds a country feel to any store. 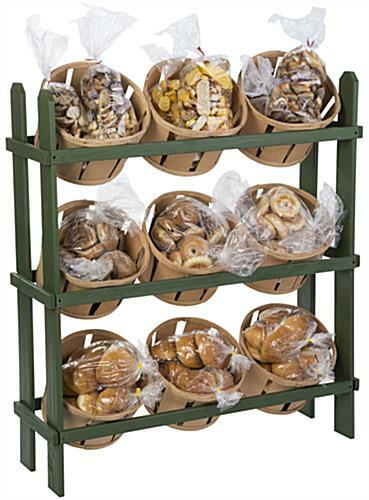 This wood basket display is great for bulk merchandising in gift shops, candy stores or specialty markets. 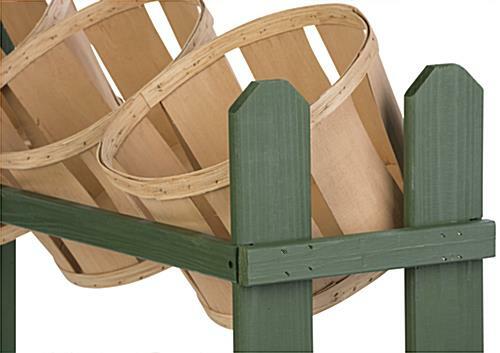 There are 3 tiers of 3 wooden bins with durable MDF bases for stability. 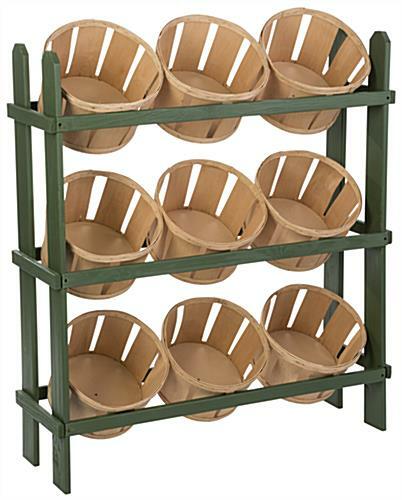 The baskets are 12" diameter x 7.5" deep and are seated in the display stand securely so you can fill them with your bulk items. 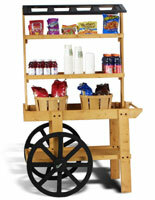 Many stores use these popular rustic merchandisers to hold wrapped candy, fruit and novelty items. The unit's full dimensions are 38.5" wide x 44" high x 11.25" deep. Spruce is a soft wood, and will show imperfections such as knots or a slightly rough feeling finish. 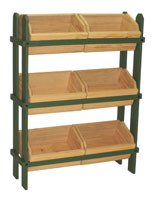 It does make for a lightweight, sturdy and inexpensive display, and the MDF base of each bin provides support and stability. 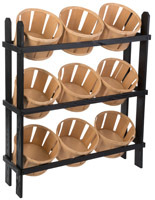 Some assembly is required, we provide the hardware and allen wrench for these display baskets. Please Note: Each basket holds approximately 1/3 of a US bushel. 38.5" x 44.0" x 11.3"
We expect to have more in stock in approximately 40 days. I love this display... it looks really great in my shop. I'd like to order another one but I will have to find another vendor b/c the shipping at Displays 2 Go is ridiculously expensive when they could have used UPS, FedEx or DHL for half the price. This is a light item and they still used one of those expensive shipping companies for it and they are a hassle to coordinate with.